Growing up, I had friends whose parents had that extra-posh ‘best room’ in their house. No one was allowed in here, and certainly not children — I was sure that it was decorated in the latest Laura Ashley colours. Even now, I still thought Laura Ashley was to be kept for those kinds of rooms (something I didn’t have). 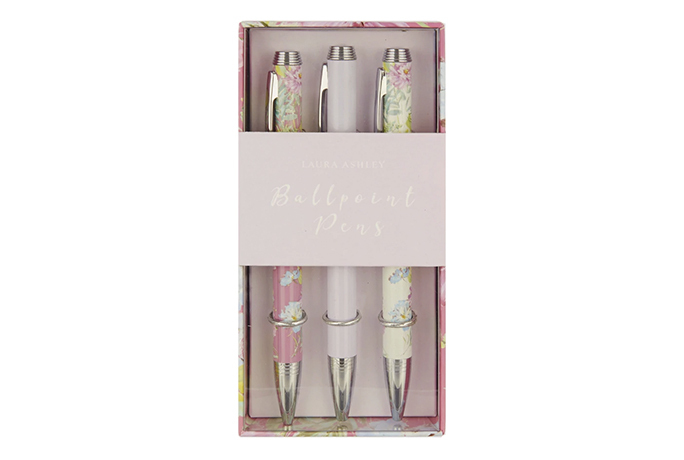 But quite recently, if an Instagram or Pinterest post would pop up I’d be surprised to find that the decor or home accessory was from Laura Ashley — and when they got in touch to see if I would like to collaborate with them my interest piqued. 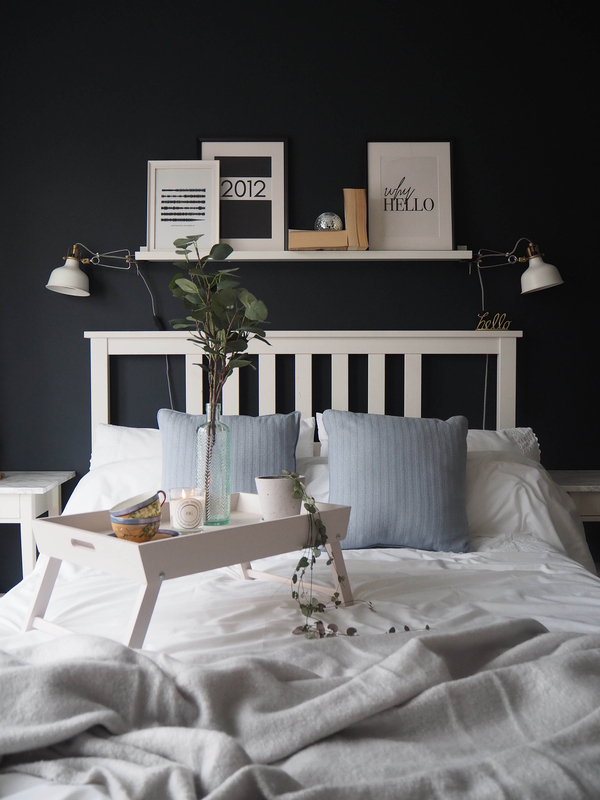 Keep reading for my top tips on what to buy for your bedroom this month. 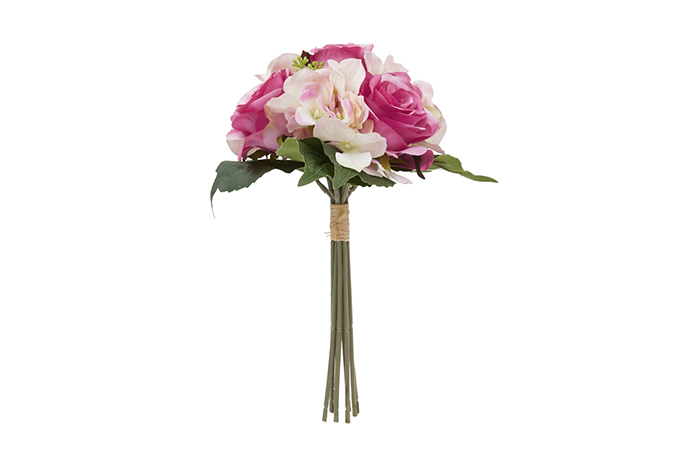 This is for every room, not just the best one. I started with the bedding and chose the Aimee Bedset. It looks simple but is classic with its broderie trim on both the duvet and the pillows which is just the right amount of frill to get past Mr T largely unnoticed! I’m not one for ironing bedding but this was so lovely that I felt it deserved special treatment when I unpacked it. I’m not sure what came over me but it was definitely worth the effort once I made the bed as it delivered the crisp effect I was after perfectly. 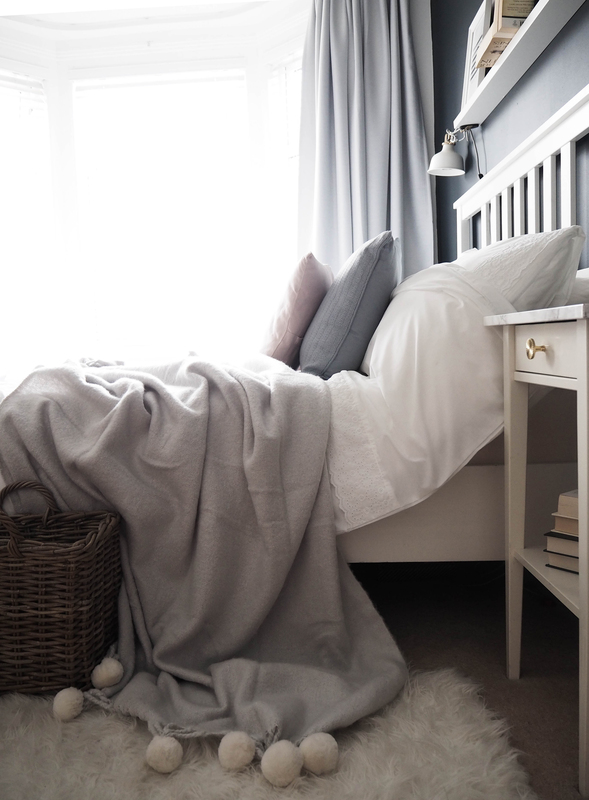 Next, I added a grey pompom throw and cushions to add tone, texture and to give a real feeling of comfort and cosiness. Plus these colours matched the curtains we have in here already so really helped pull the room together. I’m a bit of a blanket hoarder as I love nothing better than snuggling up on a cold winter’s night wrapped in a blanket watching tv, or heading to bed early and throwing an extra blanket over me to keep warm. Living in a Victorian house the heating only has to be off for five minutes and the house is freezing again so this will come in extra useful come December! 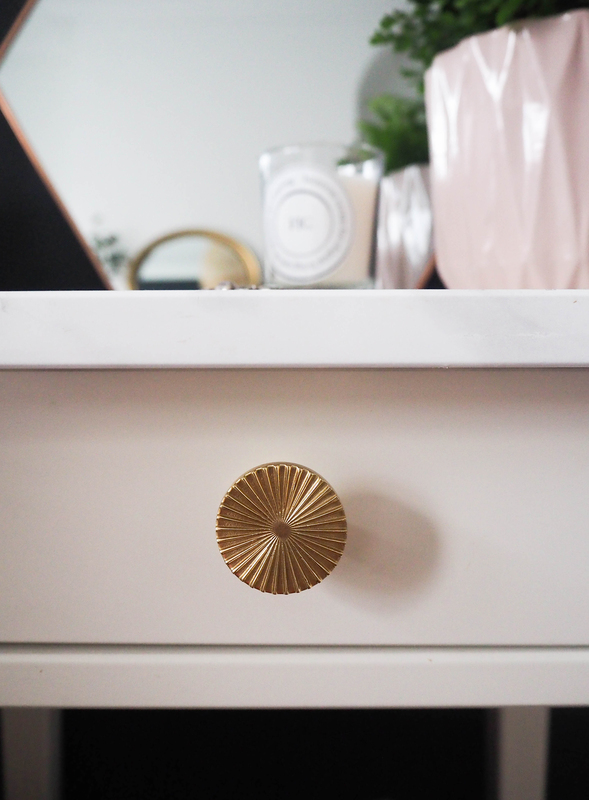 I up-cycled our bedside tables about a year ago using marble effect sticky back plastic to cover the tops and I sprayed the original handles gold, but after a year of use they were starting to look a bit worn so I decided to replace them with some new gold puller drawers to add a little bit of sophisticated glamour to the room. I think they are quite art deco looking and as you get 4 in the box they are perfect for updating any chest of drawers or wardrobe doors. Once the handles had been replaced I quickly realised that the packet of baby wipes, over-dried hydrangeas from my Nan’s garden last year and latest copy of Slimming World magazine wasn’t going to cut it as a stylish vignette next to my cosy and sophisticated new bed so I had a little faff with this area too. 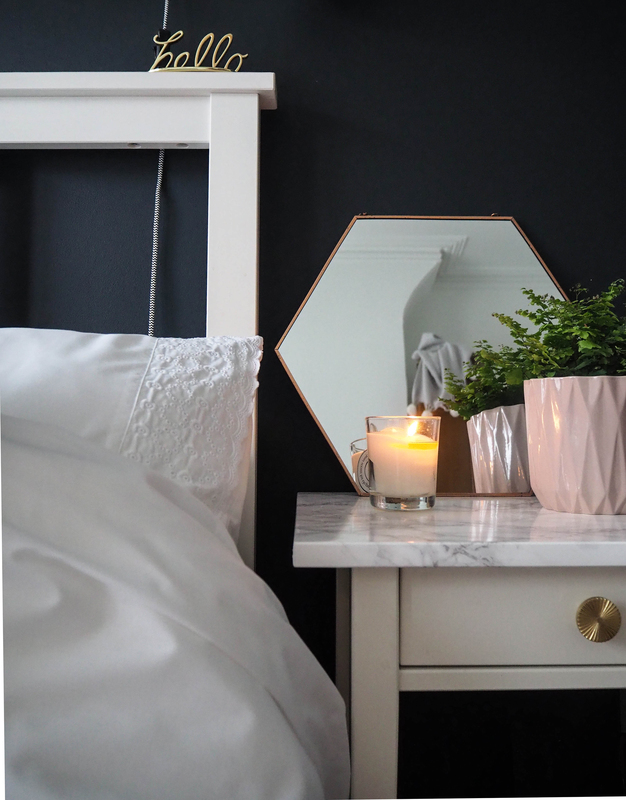 I added a gold hexagonal mirror that was a Aldi special-buy months ago but I hadn’t yet found a home for then a jar candle and finally a maiden hair fern in a pale pink geometric pot. All these things I had lying around the house and sometimes just grouping old items together in a new why makes an area look completely different and gives the items a new lease of life. Give it a go, there’s nothing better than a good faff! Now my next choice was probably fuelled by complete and utter wishful thinking on my part but I went for a wooden lap tray. I’ve wanted one of these for ages and I absolutely love it! Who knew one could get so excited over a serving tray? This single wooden serving tray does make me feel properly grown-up and I can just picture being brought breakfast in bed on it on Mother’s Day or my birthday or every Sunday……or more likely me eating my tea off it on the sofa after a long shift in work but hey, both are fine by me! My last choice of things to buy for your bedroom this month is this wicker magazine rack. It’s actually pretty big and very sturdy, however I don’t plan on using it as a magazine rack but instead for storing my collection of throws in and for generally making pictures look pretty for Instagram! 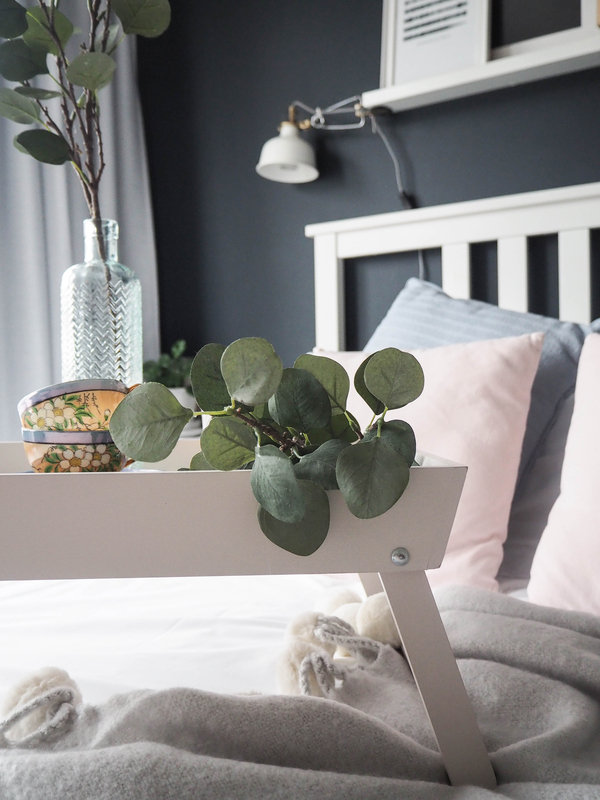 The beauty of all the pieces that I have chosen for my bedroom makeover are that, apart from the bed-set of course, everything else can be used throughout the house to mix things up and add a bit of style, interest and practicality. 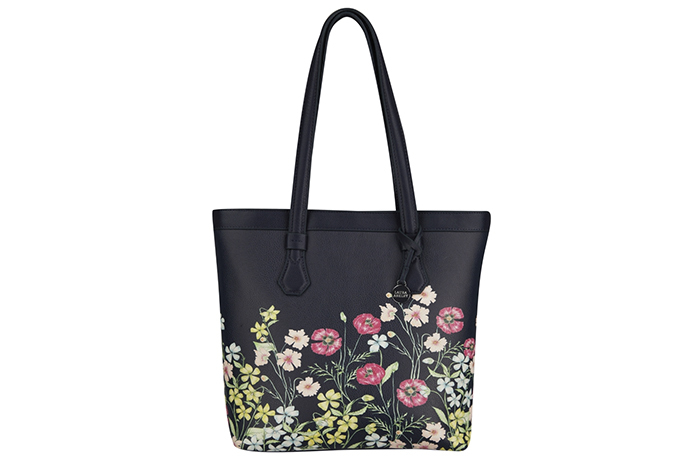 My honest opinion is that despite my initial misgivings that Laura Ashley wasn’t really for me I have been really impressed with the quality, design and style of all the pieces I got my hands on. 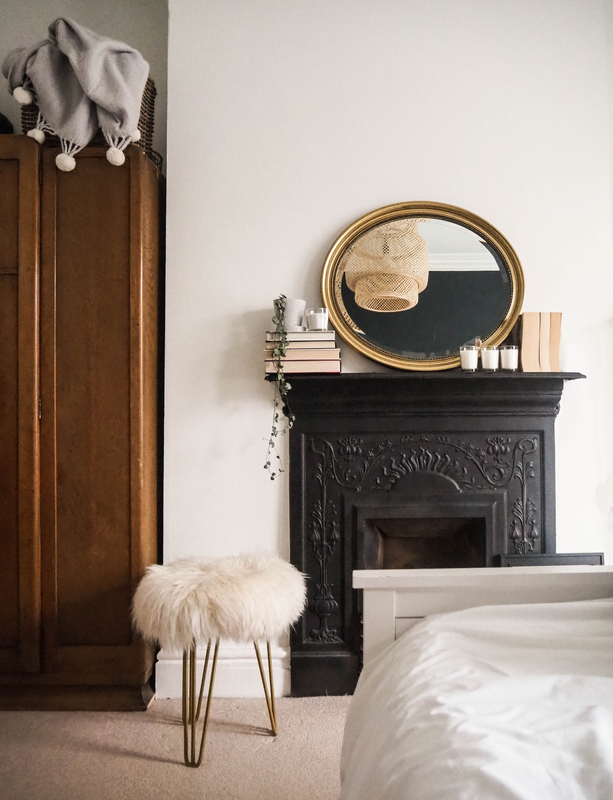 I think you’ll agree they have definitely helped create the lazy Sunday chic vibe I was after and although it is highly unlikely that I will actually get said lie-in anytime soon at least I’ll be well prepared when the time comes! 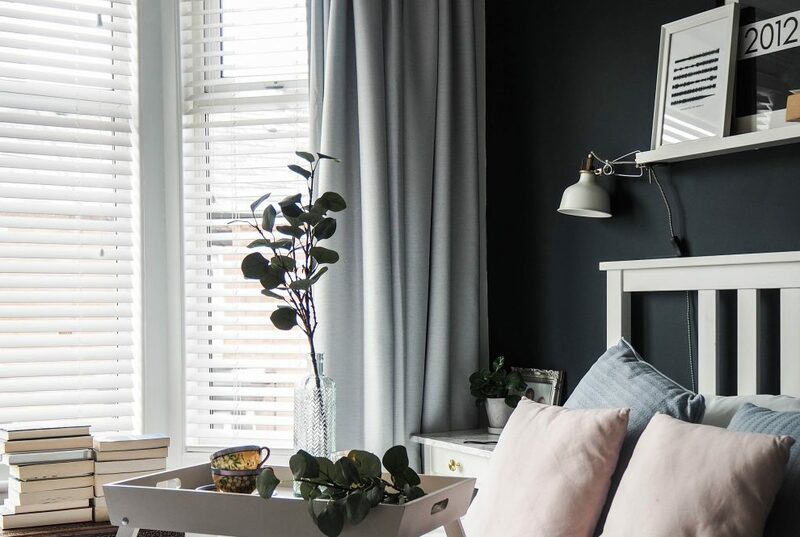 For more of Jen’s interior tips, follow her Instagram here.